At our house, Sunday morning breakfast is always a to-do. David is particularly and inexplicably jolly early in the morning, and likes to make a fuss out of breakfast once a week. Here’s a peek at his super easy, deliciously indulgent upgrade of regular old canned cinnamon rolls, directly inspired by some we had at the Georgia National Fair this year. 1) Preheat oven to 375 F. Place butter in 9 inch cake pan and place in preheating oven until melted. 2) Mix brown sugar and pecans into melted butter, coating bottom of 9 inch cake pan. Arrange cinnamon rolls on top. 3) Bake according to package instructions. 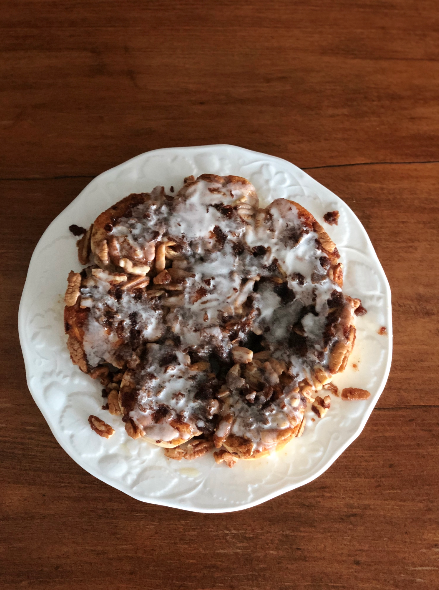 Flip cooked cinnamon rolls out onto platter. Nuke included frosting for 10 seconds, and drizzle on top.